On April 11, after a night drinking (office party) and lying around eating Ramen Noodles, I decided to run a half-marathon just for kicks. Ha seemed distant lately, and Miimii, who was talking to me again, told me I was too absorbed into Ha and needed to exercise my old hobbies, ie...running. It was great advice. I felt head-over-heels with Ha, but I still had legs and heart. My ankles hurt and I was dehydrated from the alchohol, but it was foggy that day, and I wore very subdued clothing, so the runners couldn't see me through the fog if I took off. It worked well. To my surprise, I won the 13.1 mile race by over a minute, and the best thing was my boss, Matt Bronson, who had the demeanor of Clint Eastwood and the appearance of Bart Simpson, happened to be jogging with his wife on the race course. I passed them a mile from the finish and said,"Hey..." as I flew on by with all those runners trailing more than a minute back. The next week I did it again, winning a 10 kilometer run. I was in lousy shape, posting lousy times and still beating the entire base. It was too easy. Lieutenant Murray, Matt's boss, decided to write this article about me for the base newspaper. I was on my way out of the office to make an appointment, answered Murray's questions quickly, some seriously, some not so seriously, not knowing he was writing it all down to publishing it in the base newspaper! I was sooo mis-quoted, although I did answer some of the questions tongue in cheek. But now, once again, I was a star. 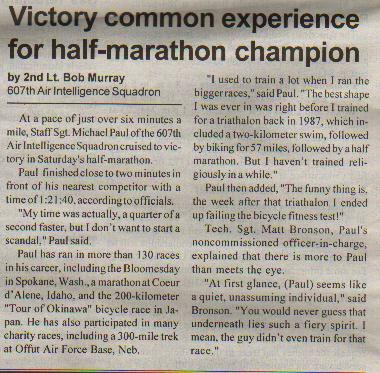 I told Lt. Murray the next time I race I'll probably get beat up because of his article. Of course, I never let Bronson forget his 'fiery spirit' remark.